What part of the world are servals found? 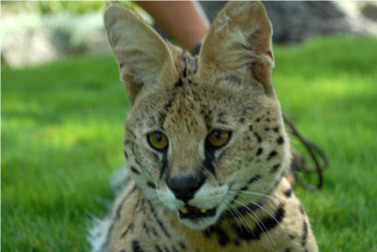 Servals are generally found within the savanna zone of Africa. Servals are very rare in North Africa where fewer than 250 mature individuals of the subspecies F. s. constantinus survive in the Atlas Mountains of Morocco. What type of habitat do servals prefer? Servals can be found in dry, open grasslands, wooded savannas, grassy uplands, but usually in riparian areas. Like all felids, servals are carnivorous, having a diet that consists primarily of hares, mole rats, rats, ground squirrels, quails, frogs, and flamingos. They catch their prey by leaping and landing on their victims with both front paws. They also have the ability to reach into deep holes or enter the water to catch prey. Servals are very efficient hunters due to their ability to leap up to ten feet into the air and due to their ability to swerve and change direction at full speed. They are so efficient that on average 40% of pounces during the day and 59% of pounces during the night are successful. 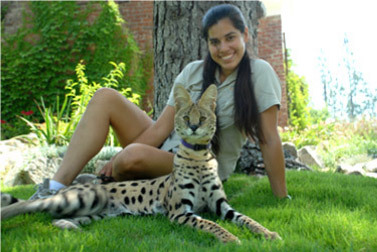 Servals usually weigh between 17 and 40 pounds with a head and body length of 26 to 40 inches long. Standing, they have a shoulder height ranging from 21 to 24 inches high and a tail length of 9 to 18 inches long. Servals have the largest ears and longest legs, relative to their body size of all felids. Males are generally larger than females. What types of adaptations do servals have? Their remarkably long legs can make up much of their height and aids in seeing over savanna grasses, to detect prey. The auditory bullae and pinnae of the ears are enlarged to enhance the detection of prey that emit high frequency sounds. What is reproduction like with servals? Little is known about the mating behavior of servals. Mating is not seasonal. During estrous males and females will hunt and rest together for several days. Gestation lasts from 65 to 75 days. On average 3 young per litter are born. 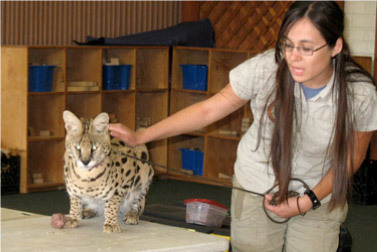 What are some of the behaviors servals show? Like most felids, servals are solitary cats that primarily communicate through urine spraying and rubbing saliva on objects. They also communicate using vocalizations such as shrill cries, growls and purring. Servals usually avoid confrontation, but conflict can arise when home ranges overlap. Servals will take cover when surprised. When threatened directly they will raise their tail and flee using sudden direction changes and leaping. Servals are primarily crepuscular, their peak activity times are between ten and eleven at night and four and five in the morning. Hunting and bringing food back to the young takes up a majority of the day for a female serval. While she is gone the kittens are hidden in a den built with thick, tall grass. Mothers will hunt for male kittens only until they are able to hunt on their own. Mothers will tolerate female kittens for longer periods. This may be why more females than males in overlapping home ranges are closely related. What is the serval’s role in its ecosystem? Servals are important predators to their ecosystems because they help to control the numbers of prey species like rodents. What is the conservation status of servals? As many as fourteen serval subspecies exist. The northern subspecies is listed as endangered while all others are listed as threatened. Servals are protected by international law. Jagschitz, K. 2002. “Leptailurus serval” (On-line), Animal Diversity Web. Accessed December 08, 2006 at http://animaldiversity.ummz.umich.edu/site/accounts/information/Leptailurus_serval.html.